I’m glad you asked. Garth Turner(GreaterFool.ca) has been telling us not to buy a house since 2008. If you live in Calgary and took his advice, here’s how it would have turned out. Furthermore, in the past, you would have had a nice selection of homes to choose from, but with today’s miniscule inventory, you can’t be choosy. Alberta will grow faster than the national average according to Royal Bank Economics. Like my reply on Garth’s blog. All i see is foreclosures and price reductions on mls. As well resale condominiums are still 30 to 40 percent below their 2007 peak prices. Just how does that translate into prices increases? My house assessment is down about 10% since 2009. But realistically the market price is about the same. Perhaps some neighbourhoods did better than Coventry Hills. Most people that bought in 08 are probably just breaking even right now. And that’s with record low inventory. Can that hold? I get that GT is a bit much, but you can’t argue that things are starting to go south. Calgary is holding up, but who knows what tomorrow brings. I’ll probably re-enter the market once my lease is up this December. By that time, I should have $400,000 saved for the type of dwelling I want. hopefully prices continue to soften until then, or at least make it a buyers market. 1. Housing prices in China. The biggest bubble in history is probably happening right now over there, and if/when it breaks, I see significant softening in the price of oil to combine with production from the North Dakota Bakkens (plus pipeline access). Vancouver is probably more exposed to this danger as Canada doesn’t track foreign ownership of property, so God knows what will happen to to this region if/when the China bubble bursts. Calgary probably not so much. 2. Canadian debt. Jeez people, stop borrowing. Interest rates have nowhere to go but up, and we’ve yet to see what effect a couple of basis point increase in the prime rate could have on Calgary. I read somewhere this morning that re-sale homes are on a downslide. It might be the new homes are still driving the stats up. I do watch mls.ca daily and I also see tons of stale listings. Any truth to that Bob? Bob, I know it affects the average much more than the median, but what, if any, effect could the hot luxury sector be having on median prices? Calgary average prices hit a new all-time high in February 2013. What I notice is that YoY Feb Total SFH sales were down 6% (1209 vs 1290) while the $1MM+ luxury sales were up 48% (59 vs 40). The luxury share of sales increased from 3.1% to 4.9% YoY. 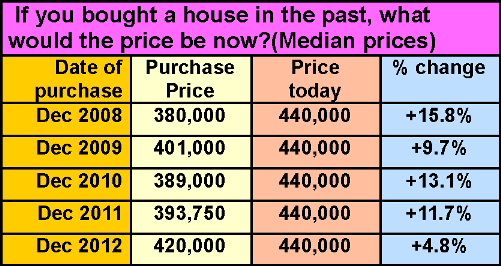 It’s still a small share of overall sales so perhaps its not really affecting median prices at all. Another thing I noticed is that only 3 of the 59 sold above list and another 5 sold at list. As Mike notes, that is against final list price, not initial. Is there anyway to see if any of these 8 luxury houmes had price reductions before being sold? If 21% of SFH buyers are paying at or above list (as per your post yesterday) while only 14% (maybe less) of luxury home buyers are buying at or above list, does that mean anything? The luxury buyers *should* be among the most astute investors in town – what can we learn from them? This could be difficult to dissect, but I’d love to know what your thoughts are. The $1MM+ sales have little effect on the median price. So far in March, the median price is $451,000. If we delete all the $1MM+ sales of which there are 40, the median becomes $445,000. That’s a difference of 1.3%. Average price is affected by 8.2%($521,114 vs $478,268). Last year, for the same time period, the average price was affected by 5.7%($465,012 vs $438,387). Three of the $1MM homes had been listed last year at a higher price. Those listings expired and some time elapsed before they were re-listed this spring at a lower price. One was previously listed at a higher price this year.